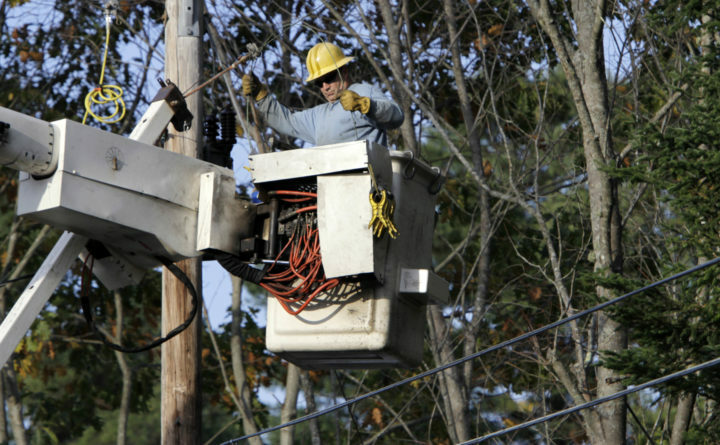 A Central Maine Power Co. linesman works to restore power for residents in Brunswick, Maine on Monday, Oct. 31, 2011. An independent auditing firm found that Central Maine Power Co.’s metering and new billing system are not to blame for the high bills last winter that had some consumers paying hundreds of dollars more than usual. In an audit report released today by the Maine Public Utilities Commission, independent auditing company Liberty Consulting Group of Pennsylvania found that the metering and billing systems operated correctly, with some minor errors. However, the auditors did fault CMP for not handling the transition to its new billing system last fall well enough and causing concern among consumers. The auditors did agree with CMP’s explanation that the high bills were partly from an unusually cold weather stretch. “Our analysis showed usage at levels consistent with the expectations that the cold weather of last winter would suggest,” the report summarized. “Moreover, supplier rates then increased substantially, adding to the effects of higher-than-typical usage. “Weather and rate changes, not meter or [advanced metering infrastructure] system error, caused high usage registration and rates across the system as a whole,” it continued. A CMP spokesperson was not immediately available for comment. The Maine Public Utilities Commission ordered the investigation of CMP’s metering, billing and customer communications issues on March 1. The audit was to determine whether the metering and billing systems are producing accurate meter measurements of customer usage, accurately transmitting the usage information to CMP’s meter data management and billing systems and then producing correct bills. The audit also looked at whether CMP has been responsive and effective in addressing customer complaints and inquiries. The auditors found that the CMP meters have produced accurate measurements of customer usage and communicated that data accurately since Nov. 1, 2017. However, they also found that one of CMP’s smart meter types did register usage inaccurately and affected small numbers of customers. The auditors also found what they called a minimal number of billing errors, but said they should not have caused the high bills that generated complaints last winter. Liberty’s report is subject to further review and process at the commission, which will consider the next steps to take at its public deliberations session on Jan. 8.